A Shinto interpretation of creation is that the world and its inhabitants are not “made” but “born,” and the divine couple Izanagi no Mikoto and Izanami no Mikoto play a central role in this narrative. The couple marry and give birth to the islands of Japan, as well as to several important natural deities that give the islands shape. This myth of Izanagi and Izanami introduces significant concepts, such as male and female roles, marriage, copulation and birth, death and the afterlife, and the birth and death cycle. In the beginning the world split into the heavens and the earth, and three kami deities of the heavenly realm came into being. Then the first reeds took root and sprouted, and two more kami deities came to be. These first five kami deities were formless and had no partners. Thereafter, however, pairs of “partner” kami deities were born in succession. The seventh and final generation was the male Izanagi no Mikoto and the female Izanami no Mikoto. At this time, the land was yet unformed and floated aimlessly like oil upon water. So, the older deities charged the pair Izanagi and Izanami with the task of bringing order to the world and granted them a sacred spear with which to do so. Standing on a bridge, the two first looked down upon the primordial mire and decided to try mixing it. They stuck the spear in, turned it about, and when they drew it back out, a drop fell from its tip. This drop settled and became the first island, Onokoro Shima. It was here that the two descended to live. After descending to the island, Izanagi and Izanami became aware of the differences in their bodies and decided to join together to give birth to the country. And so, they married by circling a sacred post three times and taking their vows. Izanami spoke her vows first but their attempts to have children ended poorly so the two redid the marriage ceremony, this time with Izanagi speaking his vows first. This time, they successfully gave birth to the islands of Japan and a host of other kami deities to give them shape. This included deity of the seas, the wind, the mountains, and all manner of natural phenomena. Unfortunately, Izanami was gravely injured giving birth to the fire kami deity, and soon died. Izanagi mourned and missed her terribly, and before long decided to travel to the land of the dead to get her back. By the time Izanagi arrived and found Izanami, she had already eaten food of the underworld. This meant she was thus unable to return. Izanagi pleaded with Izanami anyway until she agreed to ask the deities of the land of the dead if she might leave to go back to the country they were still in the process of making. Before she went to ask, Izanami made one request: she bid Izanagi not to follow her, and to wait outside until she returned. Izanagi agreed. A long time passed in Izanami’s absence, and Izanagi grew impatient. At last, he decided to disregard Izanami’s request and went to look for her. To his horror, he discovered her as a frightful, decaying corpse. Izanami was furious at being seen, and Izanagi fled in terror. He quickly exited the land of the dead. Izanami chased after him, but she soon found her way blocked by a large boulder and could follow Izanagi no further. Izanagi had placed the boulder, and so trapped Izanami in the land of the dead. After escaping, Izanagi declared the land of the dead an ugly and defiled place and decided to purify himself by cleansing. This act is today considered the origin of “misogi,” a ritual cleansing done at Shinto shrines and ceremonies where one bathes or immerses oneself in water. As Izanagi washed his face, three significant deities were born: the sun kami Amaterasu Omikami from his left eye, the moon kami Tsukuyomi no Mikoto from his right eye, and the kami of the seas Susanoo no Mikoto from his nose. Izanagi gave these three children the duties of ruling, respectively, the heavenly realm, the night realm, and the seas. 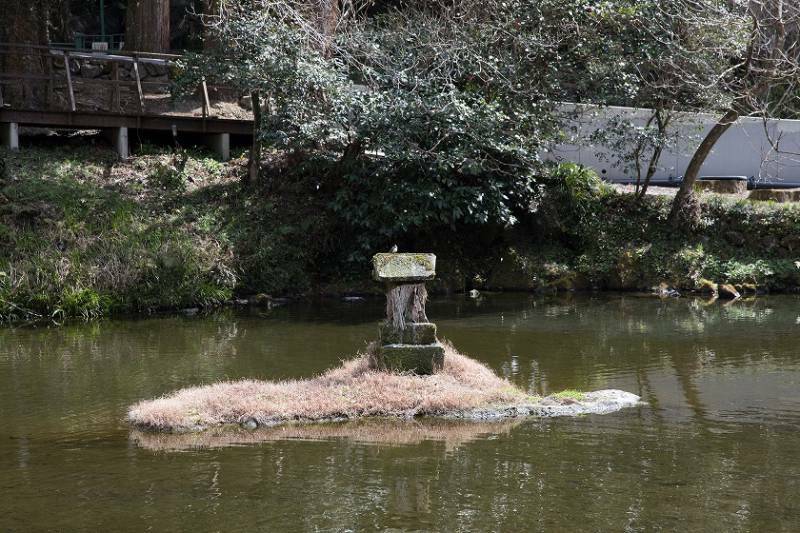 While it is difficult to determine from ancient documents exactly where these events would have taken place, Takachiho local belief considers the island in the center of Onokoro Pond near Takachiho Gorge to be Onokoro Shima, the place where Izanami and Izanagi married, lived, and gave birth to the islands of Japan. In this belief, Takachiho is where the Japanese archipelago, both its natural formations and its inhabitants, was born. In a famous Japanese mythical tale, the sun kami deity Amaterasu Omikami hid away in a cave and plunged the world into darkness. To lure her back out, myriads of kami deities enacted an elaborate ruse: they staged a festival with song and dance outside the cave’s entrance. Amaterasu, perplexed by the revelry outside, cracked open the stone door of the cave to peek out, and the deities used the opportunity to pry open the door and fling it away. Thus, a festival helped restore light to the world. Amaterasu is enshrined at Takachiho’s Amano Iwato Shrine. It is here that Amano Iwato (the cave in which Amaterasu hid) and Amano Yasukawara (the area where the kami gathered to discuss their strategy to lure her out) are said to be located. Three kami deities were born of Izanagi when he returned from the underworld: the sun kami deity Amaterasu Omikami, ruler of the heavenly realm; the moon kami deity Tsukuyomi no Mikoto, ruler of the night realm; and the kami deity of the sea Susanoo no Mikoto, ruler of the seas. Among the three sibling deities, Susanoo alone shirked his responsibilities, and so Izanagi banished him from the heavens. Before Susanoo left, he decided to speak to his older sister, Amaterasu, and made his way to her realm. The commotion of his coming made Amaterasu suspicious of her mischievous brother’s intentions, and they argued. Susanoo decided to retaliate with cruel pranks. First, he destroyed Amaterasu’s rice fields and defiled her sacred hall, then he tossed a skinned horse into her sacred weaving hall. One of Amaterasu’s weavers saw the horse and died of shock, causing Amaterasu terrible grief. Infuriated, she hid herself in a cave. As she is the kami deity that sits as the sun in the heavens, this plunged all into darkness and chaos. The great multitudes of deities of the heavens were terribly distressed and gathered near the riverside at Amano Yasukawara to discuss how to lure Amaterasu the sun deity out again. First, they gathered up cockerels that crow at the break of dawn and set them to crowing. Next, they placed a large, holy sakaki tree outside the cave, and decorated it with strings of sacred magatama jewels, fine clothes, and an elegant mirror forged from materials of the heavenly mine. Then, the kami deity named Ame no Koyane no Mikoto recited a prayer, and the kami deity named Ame no Uzume no Mikoto began to perform a dance. This dance so pleased the assembled gods that they filled the air with laughter. Amaterasu grew perplexed by the festive noise outside and cracked open the stone door of the cave to peek out. She asked, “Since I am in here, should not all be in darkness? Why are you all dancing and laughing?” To this, the dancing deity Ame no Uzume answered, “We are merry for there is one more glorious than you out here among us.” This trick to draw Amaterasu worked. Curious, Amaterasu opened the stone door wider to catch a glimpse of the “glorious kami deity.” Instead, she was distracted by her own reflection in the mirror. A kami deity of incredible strength named Tajikarao no Mikoto waited at the entrance, and quickly grabbed hold of the door and flung it away. Thus, Amaterasu was lured out from hiding and light was restored to the world. Amaterasu the sun deity is revered at Amano Iwato Shrine. From the West Sanctuary of the shrine, there is a view of the believed location of Amano Iwato cave, where Amaterasu hid. 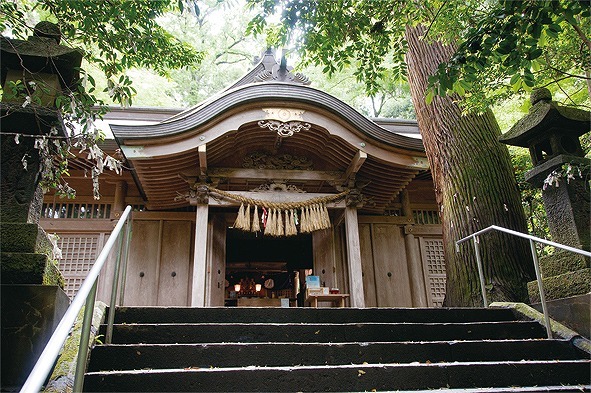 A short trail from the West Sanctuary leads to the entrance of the riverside cave said to be Amano Yasukawara, where the multitudes of kami gathered to discuss luring the sun deity from hiding. Visitors today often stack stones here to make wishes, which has led to tall piles of stones crowding the cave floor. According to the Kojiki, Japan’s oldest remaining chronicle, the sun kami deity Amaterasu Omikami sent her grandson, Ninigi no Mikoto, to rule the lands of Japan. He took with him three gifts, a jewel, a mirror, and a sword (which would later become the imperial regalia of Japan). It is written that Ninigi and his procession made their way through the heavens and descended at “Kushifurutake of Takachiho.” Upon arrival, Ninigi declared the land good, and so established there a grand residence. Kushifuru no Mine, the mountain believed to be the site of this descent, is where Takachiho’s Kushifuru Shrine now stands. In Japanese mythology, the first emperor of Japan is Ninigi’s great-grandson. Amaterasu, the sun kami and ruler of the Heavenly Realm, looked down upon the earth and saw that it was in terrible chaos. So, she sent heavenly deities below to bring order to the land. It took many years of trial and tribulation, but finally it was done. She then declared, “My child, Ameno Oshihomimi no Mikoto, shall rule this land.” However, when she approached her son and ordered him to descend from the heavens to assume his duty, Ameno Oshihomimi explained that he had now married and had children. Presenting to Amaterasu his son, Ninigi no Mikoto, he suggested that Ninigi be sent to govern the islands of Japan in his place. Amaterasu looked upon her grandson and was convinced. And so, Ninigi prepared to descend from the Heavenly Realm. He gathered the jewel (Yasakani no Magatama) and the mirror (Yata no Kagami) that helped lure Amaterasu from her the cave, as well as the sword (Kusanagi no Tsurugi) that Susanoo no Mikoto had taken from the tail of a great serpent and presented to Amaterasu, his sister. These three treasures would later become the Imperial Regalia of Japan. Amaterasu instructed Ninigi to rule the islands of Japan in her honor, and to treat the mirror he carried reverently as an embodiment of her spirit. Preparations thus complete, Ninigi departed the Heavenly Realm with several kami deity accompanying him in a procession. It is written that Ninigi led the way through the heavens, and that the procession descended to "Kushifurutake of Takachiho” in Hyuga, Tsukushi Province, an ancient province located in the northern part of modern Kyushu. Upon arrival, Ninigi declared the land good, and so built there for himself a grand palace of stout columns with a soaring roof. Kushifuru Shine, which venerates Ninigi, was built in 1694 upon the mountain where he and his procession are believed to have arrived. Prior to this, the mountain itself (now known as Kushifuru no Mine) was considered to be a residence of kami deities and was thus considered sacred. In Japanese mythology, Ninigi’s great-grandson becomes the first emperor of Japan, and so the mythological heavenly origins of Japan’s imperial line are traced back through him. There exists another legend in the Takachiho area about Ninigi’s descent to the islands of Japan. In this legend, Ninigi and his procession met an impenetrable fog on their way to earth and lost the way forward. At that moment, two inhabitants of earth named Ōkuwa and Okuwa appeared. They urged Ninigi to take rice from the stalks he held in his hand and scatter it over the land. Upon doing so, the fog lifted and Ninigi and his entourage were able to descend safely to islands of Japan (earth). The precious (Japanese: 高 “taka”) rice Ninigi scattered from many (Japanese: 千 “chi”) rice stalks (Japanese: 稲穂 “ina-ho”) is said to be the mythical derivation of the town name Takachiho (高千穂). 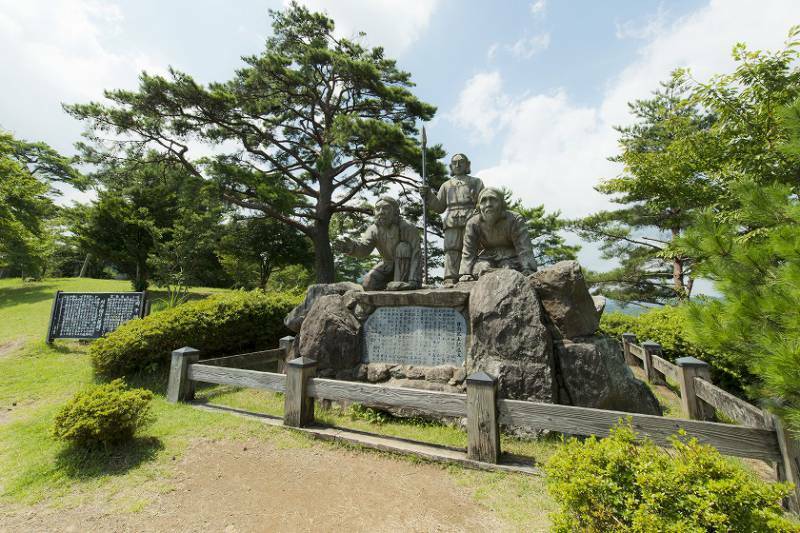 A statue at the foot of “Country Gazing Hill” (Kunimigaoka) commemorates this legend. Japanese mythology states that the kami deity Ame no Uzume no Mikoto, whose dance helped restore light to the world, was sent as a representative to confront a massive earth kami deity named Sarutahiko no Mikoto at a crossroads in the heavens. She was in the entourage of Ninigi no Mikoto, the child of the kami of the heavens, descending to rule the islands of Japan. Takachiho legend says that Ame no Uzume and Sarutahiko married once all arrived safely to earth, and that they built a residence together near Kushifuru Peak. 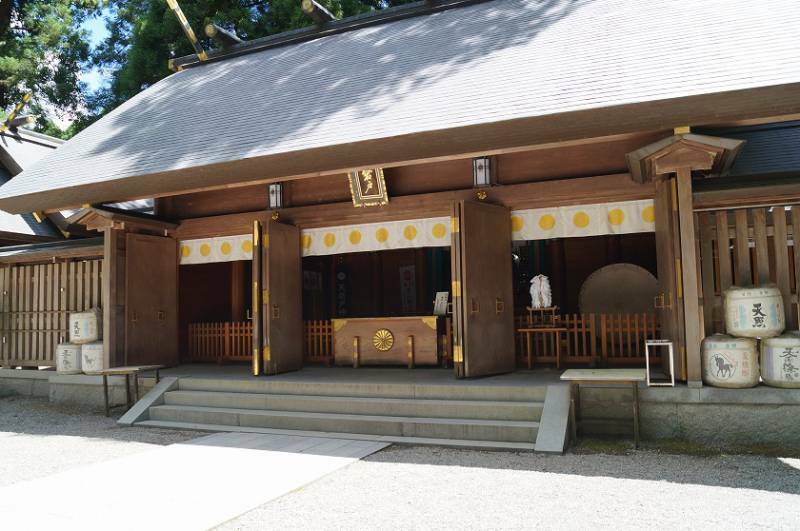 Today, Aratate Shrine honors them as kami deities of matrimonial happiness and fulfilled wishes. It is written in both the Kojiki and the Nihon Shoki, two ancient texts recording the origins of Shinto, that as Ninigi no Mikoto descended to take up rulership of the islands of Japan, he and his procession came upon a massive kami deity at a vast intersection in the heavens. This kami was illuminating the heavenly realm above and the islands below. At the sight of the deity, Ninigi turned to Ame no Uzume no Mikoto. She is the deity whose dancing helped return light to the world by luring Ninigi’s grandmother, the sun kami deity Amaterasu Omikami, out of hiding. Ninigi said to Ame no Uzume, “You may be delicate, but you can face down any deity. That is why I bid you to approach that deity there and ask, ‘Who is it that stands in our way?’” Heartened by Ninigi’s words, Ame no Uzume confronted the large kami deity and asked his name. The deity answered, “I am an earthly kami named Sarutahiko no Mikoto. I am here because I heard a child of the heavens would like to descend to earth, and I thought I would serve as a guide.” Ninigi accepted the offer and, with Sarutahiko’s guidance, all arrived safely at Kushifuru Peak. 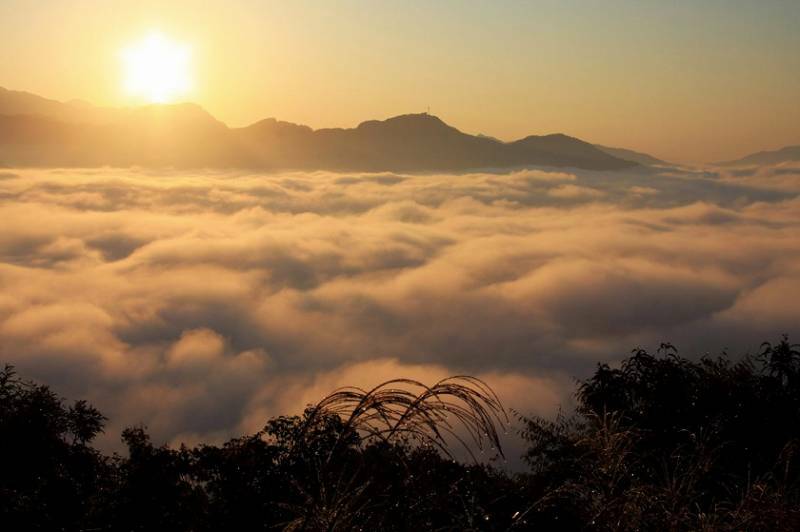 According to Takachiho legend, this meeting was a once-in-a-lifetime encounter for the heavenly deity Ame no Uzume and the earthly deity Sarutahiko. As soon as they reached earth, the two married with the blessing of Ninigi, and in a great rush gathered any wood they could find from the surrounding area to build a home. 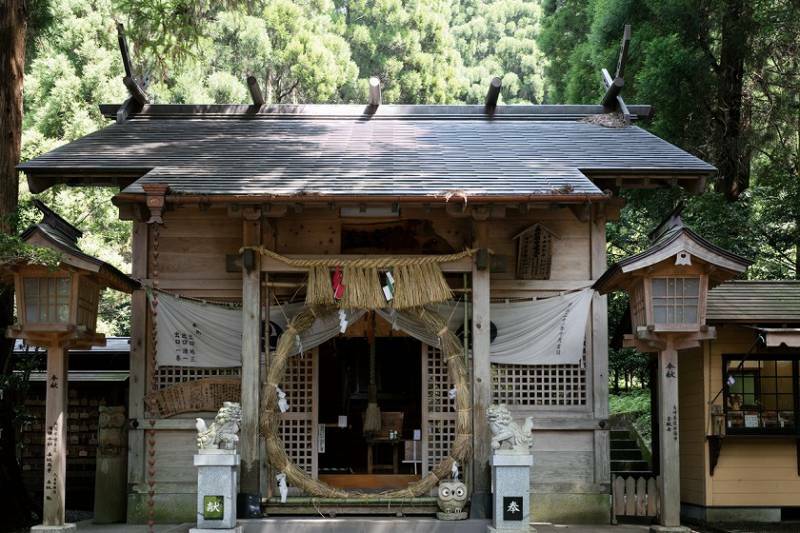 Today the Aratate Shrine, whose name references the raw, unseasoned timber (Japanese: “ara-ki”) from which their home was built (Japanese: “tate”), venerates them and their relationship. Ame no Uzume is known as a kami deity of song, dance, and the performing arts. She is celebrated fondly in Takachiho through kagura, the Shinto theatrical dance said to originate with her. Sarutahiko is known as a kami deity of guidance in travel and education. Together, she and Sarutahiko are kami deities of matrimonial happiness, fulfilled wishes, and creative pursuits. In the ancient Nihon Shoki (Chronicles of Japan) it is written that Mikeiri no Mikoto, the older brother to the first emperor of Japan, was lost at sea while heading to the east of Japan. 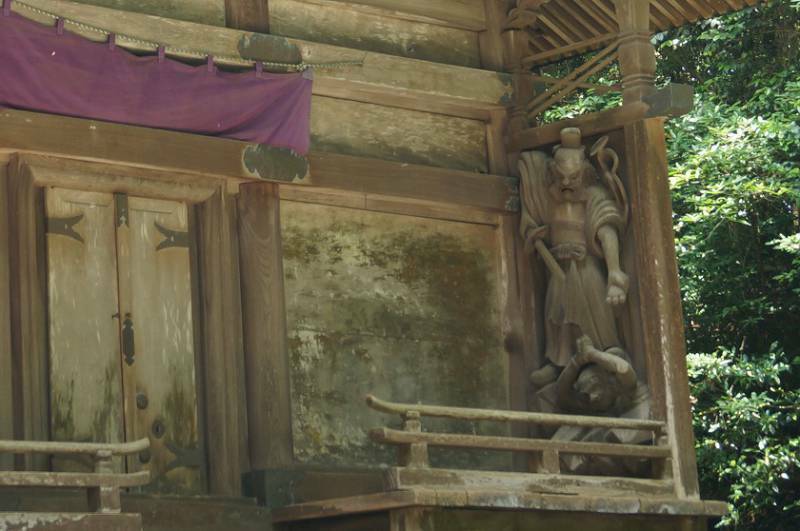 However, Takachiho legend says that Mikeiri was not lost but instead returned to his hometown of Takachiho, and that upon his return, he battled and vanquished a fearsome deity named Kihachi. Kihachi had terrorized the local populace and seemed undefeatable. However, after a fierce battle, Mikeiri cut Kihachi up and buried him in three pieces, putting him to rest. 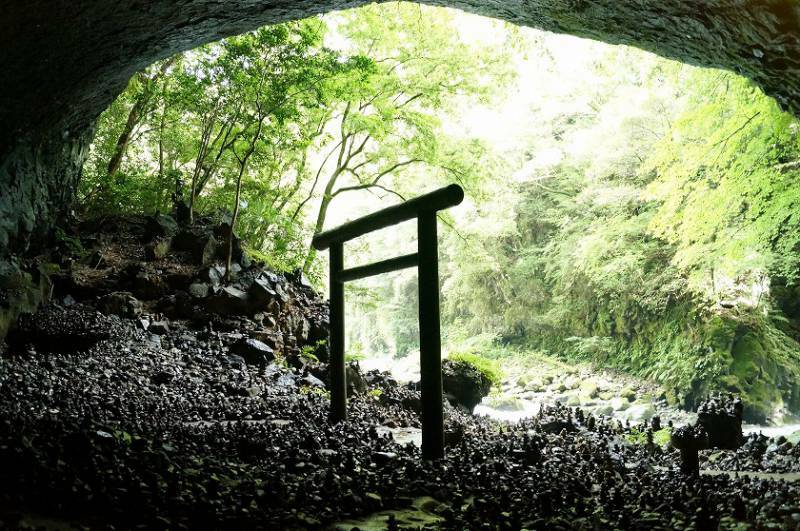 The Kihachi legend is a well-known one in Takachiho to this day, and traces of it can be found around the Takachiho area. Every year, Takachiho Shrine hosts the Boar Offering Festival to appease Kihachi’s spirit so he does not rise to cause trouble again. 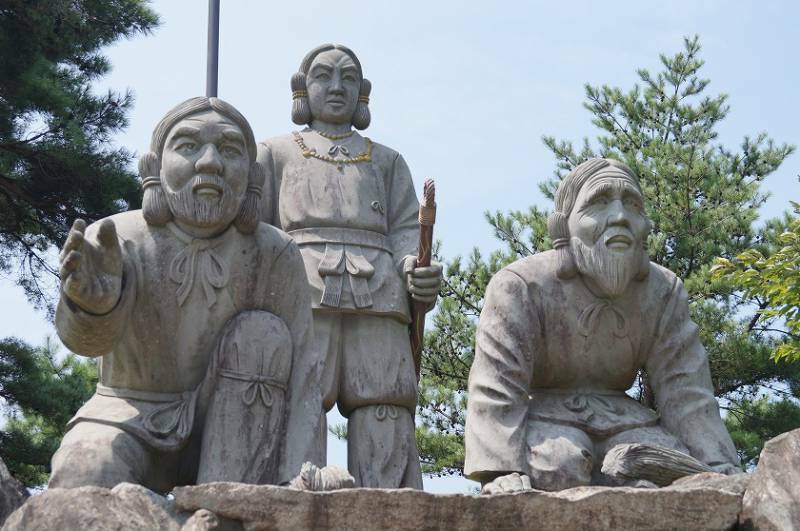 It is said that long ago, a fearsome kami deity named Kihachi lived in a cave on Mt. Futagami. He descended the mountain to terrorize the people of Araragi Village, and thereafter, kidnapped Princess Unome and hid away in Oniga Iwaya cave. 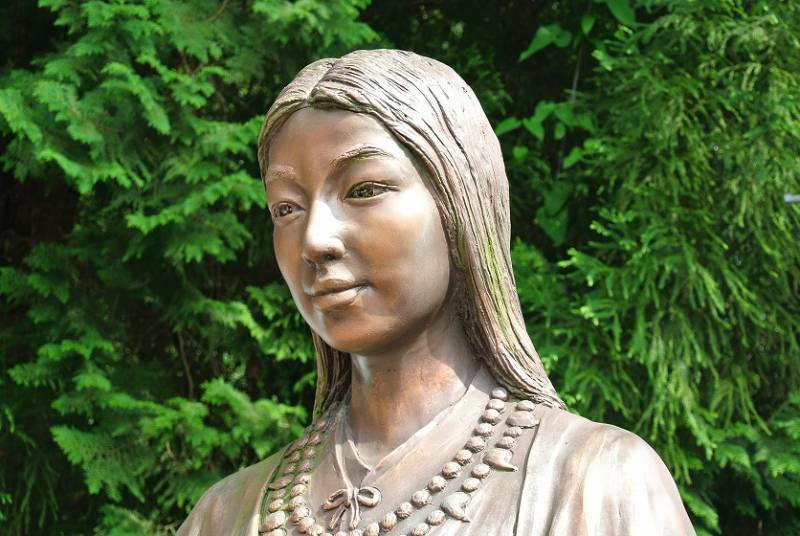 Mikeiri no Mikoto, older brother to the first emperor of Japan, and a renowned warrior, had returned to his hometown Takachiho, and while crossing Takachiho’s Gokase River spotted a beautiful woman reflected in the surface of a pond. He was immediately captivated. This reflection was of Princess Unome, and it revealed to him a terrible problem: Kihachi had stolen her to marry against her will. Moved by this plea for help, Mikeiri decided to vanquish Kihachi. Gathering forty-four vassals, he raided Kihachi’s cave. A fierce battle commenced, and Kihachi’s strength proved formidable. Mikeiri managed to defeat Kihachi, but this was not the end. After a single night, Kihachi’s buried remains returned to life, and he rose from the earth in a rage. At their next battle, Mikeiri divided Kihachi into three parts—head, torso, and limbs—and buried them in separate places. This, at last, saw to it that Kihachi did not rise again. Mikeiri then married the rescued Princess Unome, and together they had eight children. His descendants are said to have ruled over Takachiho. 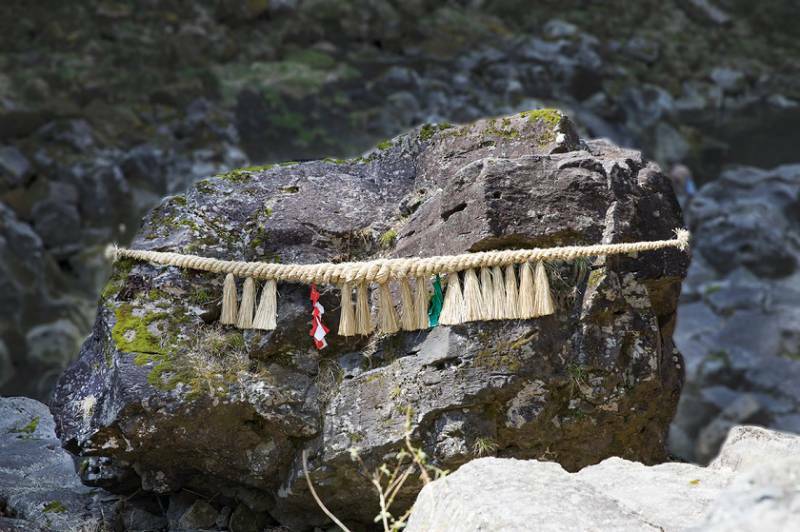 The physical remnants of this legend can be found around Takachiho today. Several are near Takachiho Gorge, including Nanatsuga Pond, where Mikeiri is said to have first seen Princess Unome, and the Stone of Kihachi’s Might (Chikara Ishi), a 200-ton rock Kihachi is said to have hurled during that first battle. 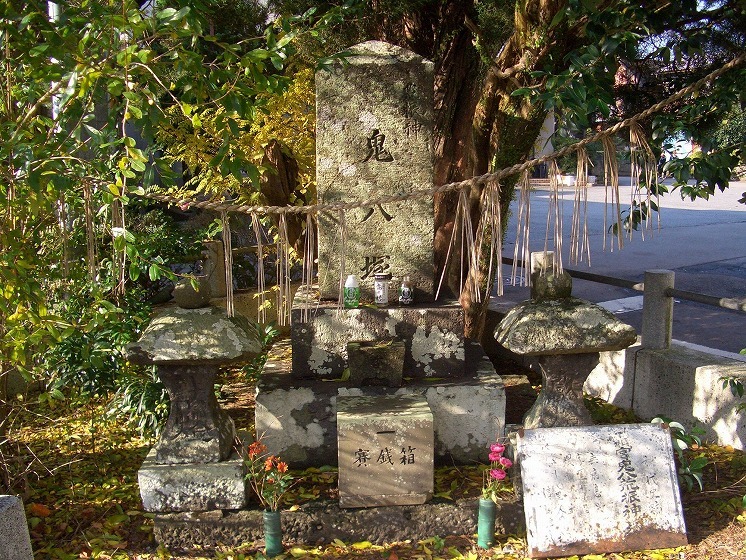 The three spots where Kihachi’s parts are buried, indicated with stone monuments, can be visited. Kihachi’s head is near Solest Takachiho Hotel, his torso is 50 meters west of Ryokan Shinsen, and his limbs are at the remains of Awaji Castle behind Takachiho High School. As for the legend today, it is said in Takachiho that although Kihachi has been vanquished, his vengeful spirit sometimes rouses, bringing early frost to ruin crops. 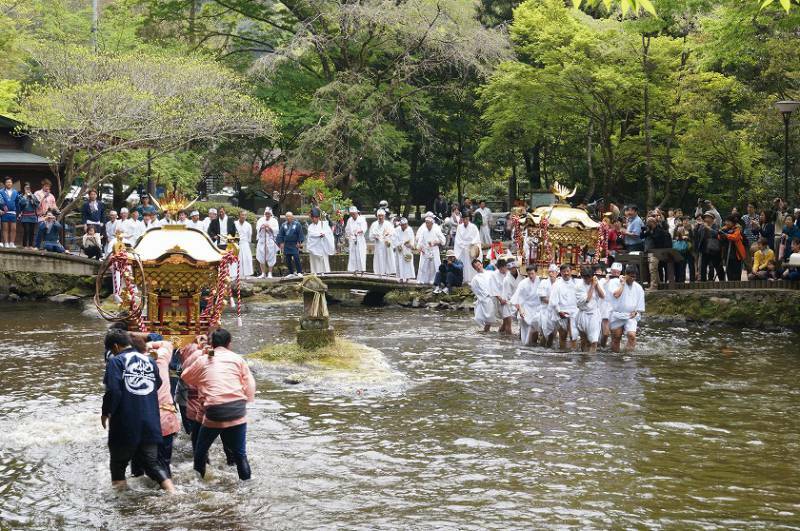 So, Takachiho Shrine holds an annual festival to placate Kihachi. A boar is offered, and Shinto priests chant a special song to put Kihachi to sleep. Kagura, a theatrical Shinto dance, is also performed. The festival is called the Shishikake (Boar Offering) Festival, and it is held on the third day of the twelfth month of the lunar calendar, which is in January most years.